An angel's wings symbolises protection and the heart is the universal symbol of love showing how much you love and cherish your pup. 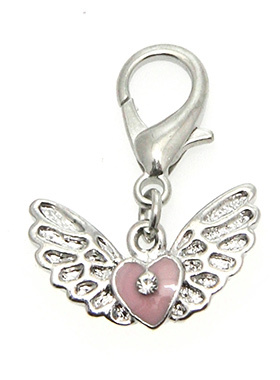 This charm is beautifully finished with a pink enamel heart flanked with silver plated wings. Attaches to any collar's D-ring with a lobster clip. Measures approx. 3.4'' / 2.0cm wide. Measures approx. 3.4'' / 2.0cm wide.